Rudy Giuliani, head advisor to Donald Trump and taxidermic gopher, is fretting over the slim but mighty corpse voter contingency. On Sunday, he told CNN’s Jake Tapper that the election could tip in Hillary Clinton’s favor due to corrupt voting practices—keeping dead people registered, for instance—in the inner cities. And, to be clear, only Democrats will be engaging in this illegal activity. The former New York City mayor pointed specifically to Chicago and to Philadelphia as cities where votes would be cast from the afterlife. According to Giuliani, 72o dead people voted in a Chicago election when he was a prosecutor and, years later, 60 of the deceased cast ballots in his mayoral election. Trump continues to promise victory while bellyaching that the election has been “rigged” against him. The orange spray-painted port-a-john has spent the weekend fussing on Twitter about the inequities to which he has been subjected. Giuliani did concede that election fraud would only impact close races of one to two percentage points. If the margin is wider, “rigging” won’t influence the outcome. Giuliani brushed off the troubling remark as “wacko” talk, primarily emphasizing that Trump was not to blame for it. Tapper also questioned Giuliani’s assertion that the inner cities would employ dishonest voting procedures. In 2012, he remarked, Mitt Romney’s significant loss in Philadelphia had nothing to do with election fraud. Republicans themselves had found this theory to be false. “I think there are a lot of elections experts that would have very, very strong disagreements with you,” he told Giuliani. At the very least, Democrats can rest easy knowing that Republicans will play fair and square. 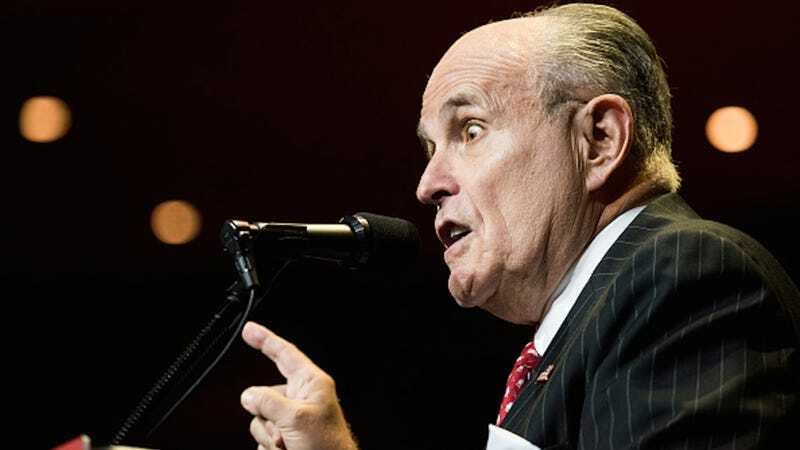 Click the video below to hear Giuliani pose his socioeconomically and racially prejudiced argument on inner city afterlife voting.